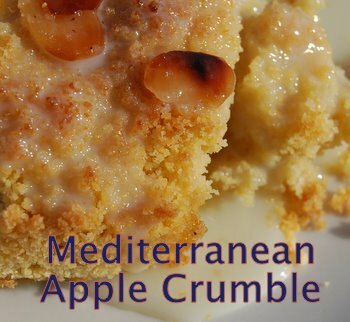 We love this Apple Crumble Recipe, but wanted to give it a Mediterranean twist and flavour. 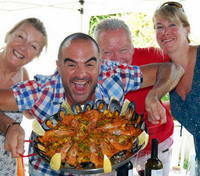 So we have added cinnamon, toasted flaked almonds and fresh lemon juice and zest. 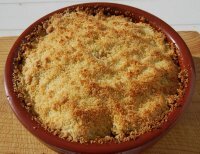 To make it as healthy as possible there is less crumble and more of the juicy and delicious aromatic and crunchy apple mixture underneath. It's quick and easy too, just follow the step-by-step instructions below. Into a food processor fitted with a pastry blade add the flour, demerara/brown sugar and butter. Pulse the mixture in short sharp bursts until it resembles fine breadcrumbs. Put the sliced apple into a large bowl, add the lemon juice, zest, caster sugar, flaked almonds and cornflour. Mix these ingredients thoroughly together and then pile into your baking dish (the cornflour will slightly thicken the juices that run out during cooking, so that it is not watery). Pile the crumble mixture on top of the apples (there may seem a lot of the apple mix but it shrinks during cooking), spreading it over evenly. Before you put it into the oven take a fork and rough the surface up a little, so it looks more crumbly than smooth. Bake for approximately 30 - 40 minutes until golden brown. 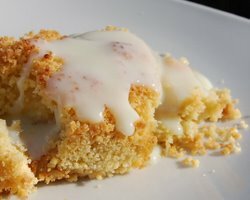 Serve immediately with cream, creme fraiche or custard - absolutely delicious, just perfect for the cooler Winter months.